Coming soon to our Between the Lines range of models from Good Ground Miniatures. More 10mm goodness from Mike Randles. I am pleased to present the Troup Hurt Home, which was in the middle for the fighting, literally Between the Lines, during this vicious battle. 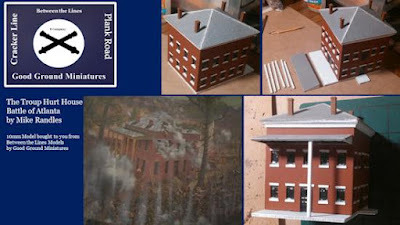 As always, this model will work well in 10mm or 15mm, as it is a rather large building. More to come on release dates for this great piece.